A pair of Dakota Minnesota and Eastern locomotives, with a leased unit trailing, may not seem too unusual - until you remember you're on CSX in the middle of Pennsylvania. ©2012 Ryan C Kunkle, licensed to About.com, Inc.
Model railroaders who choose to follow a prototype do so for many reasons. One advantage is that it makes it harder to stray away from what you need and splurge on any model that catches your eye. Maintaining a consistant theme also greatly improves the realism of any layout. But as with everything else, there are exceptions to every rule. Fortunately if you study the prototype for any length of time, you'll quickly find plenty of examples of locomotives in places you'd least expect them. Modelers and railfans often call this "foreign power," in that it does not belong to the railroad on which it is running. It is not uncommon in North America today for locomotives from Canada and the United States to cross the border - creating true foreign power as well. Santa Fe steam locomotives in Ohio on the Pennsylvania? Norfolk Southern diesels in southern California on the Union Pacific? Western Maryland power on the Reading? All are prototypical scenarios which illustrate the fact that no matter how big the railroad, there was always a need to beg, borrow, and yes in some cases - steal! Not only does the practice of sharing power make train watching more interesting, it can also add a new level of fun to your next model operating session. Demonstrator locomotives haven't been limited to diesels. Steam builders also produced show pieces to demonstrate new innovations. This Bachmann model is somewhat freelanced, but captures the overall look. ©2012 Ryan C Kunkle, licensed to About.com, Inc.
From early steam locomotives to the FT diesels to today's modern diesels, builders often sell the latest technologies by showing railroads their performance first hand. Occasionally railroads too will loan their locomotives out for testing. This was even more common in the age of steam, when custom designs were the standard, not the exception. Demonstrator locomotives travel from railroad to railroad, operating for weeks or months at a time for evaluation. During the testing period, a special car supplied by the manufacturer or the railroad will often accompany the locomotives to allow first hand observation. The car is often equipped with dynamometers and other testing devices to help measure pulling power, fuel efficiency, acceleration and every other vital statistic. Long-term trials may not involve accompaniment on every trip, but afford the railroad the opportunity to try out several operating scenarios and evaluate efficiencies over time. While on the property, the locomotives may be used only independently, or mixed with the road's own power. Demonstrators are always guaranteed to attract attention. Not only are they the latest thing, but builders usually take a little extra pride in the paint schemes applied to these locomotives to ensure they'll stand out in any consist. For modelers, not only does this add some color and diversity to our fleet, it also provides the opportunity to run some equipment "our" railroads never owned. After all, railroads didn't always buy everything they tested. After testing was completed, builders often sold the demonstrator units. At this point, they are usually painted in the conventional scheme of the railroad and are much harder to pick out of a crowd. Particularly poor-performing locomotives may not find a buyer and are often taken back to the builder and added to their leasing fleet or become testbeds for the next new innovation. After experimenting with three SD60s on loan for a few years, Burlington Northern returned the units to EMD - who repainted them and repurposed them for its lease fleet where they roamed the country earning their keep. ©2011 Ryan C Kunkle, licensed to About.com, Inc.
Railroad traffic levels rise and fall along with all other types of commerce. The economy, seasonal shipments and other factors can create surges in traffic. Locomotives are expensive capital investments, and railroads can't afford to have them sitting around waiting for rush hour. To compensate for this, railroads will often lease extra equipment when needed. From a modeling perspective, lease units present an amazing variety of motive power options. Not only could just about any type of locomotive be used, but the paint schemes they wear can range from flashy custom designs to bland "quick and dirty" repaints to patched out paint schemes from previous owners. Often locomotives are borrowed from a leasing company, but occassionally railroads will lease locomotives directly from each other. Leasing companies don't generally purchase new power. Locomotive lease fleets are dominated by slightly older equipment, retired by the railroads. Often the equipment is rebuilt and extensively overhauled. Depending on how quickly the company wants to return the power to service, it may or may not be repainted. In some cases, railroads sell off old equipment only to lease it back again years or even months later. The practice has become far more common since the 1970s, but it was not unheard of even in the days of steam. Santa Fe 2-10-4s and Reading 4-8-4s could both be found at different times on the Pennsylvania Railroad for example. With so many leasing companies and models out there, a leased locomotive is an easy and attractive subject for any "power-short" layout. Since most leasing companies today operate under the moniker of their initials (HLMX, FURX, GECX, etc.) they are easy to model - or to freelance. If you're a modeler who just likes everything, then creating your own leasing company would be a great way to have license to model just about anything. CSX has a large network - but it doesn't reach Nebraska. A former Conrail unit seems out numbered and out of place in the heart of Union Pacific country as it works west running off power-hours. ©2012 Ryan C Kunkle, licensed to About.com, Inc.
Perhaps the most common occurance of power wandering to other railroads happens as a result of cooperative operations. Freight cars are interchanged between railroads every day - without that, the system as a whole would not work. Although they don't roam as frequently, locomotives can run from road to road too. Locomotive pools arive from a variety of factors. Sometimes, equipment is left on to speed schedules. This became more common with diesels, since the locomotives' operating range was so much greater and parts were more standardized between roads. On long-distance dedicated trains, each railroad might supply a certain number of locomotives to a pool for that service, based on the mileage the train traveled over their line. Instead of uncoupling and replacing power at interchange points, the locomotives simply stayed with the train. This practice also occurs on a less scheduled-basis. Railroads keep track of how much time their locomotives spend on another line. The borrowing line can either pay for the use monetarily, or by use of comparable locomotives on the lending road. As you can probably tell, this practice requires a lot of accounting - something we don't have to worry about on our model railroads. On a model railroad, pooled power would most likely be seen in the form of locomotives from a connecting line. It is not uncommon to find more outlandish scenarios however. Railroads have been known to use locomotives borrowed from another line or leasing company to pay off power-hours to yet another company! A Buffalo and Pittsburgh train rolls into CSX's New Castle Yard via trackage rights. It's cars will be sorted and continue on, but the power will return to home rails with a new consist. ©2011 Ryan C Kunkle, licensed to About.com, Inc. Yet one more option for "foreign power" comes in the form of what railroaders call "trackage rights." In this case, it is not just the locomotives, but the entire train that belongs to a different railroad. Often done as the result of mergers or consolidations to protect competition, railroads may grant each other the rights to use their tracks. These can be standing agreements, or short-term affairs such as in the event of a derailment or other problem. Parallel lines could host "detour" trains from the competing railroad. More lasting agreements might involve something like access to a major industry or port. Rather than build duplicate facilities, one railroad will simply pay the other a fee for use of their tracks. In some cases, railroads will even go together on the construction of new lines if it is mutually beneficial. On a model railroad, these trackage rights can be used in many ways. You could host a "run through" train that does not stop or do any switching on your line but simply travels over the road. 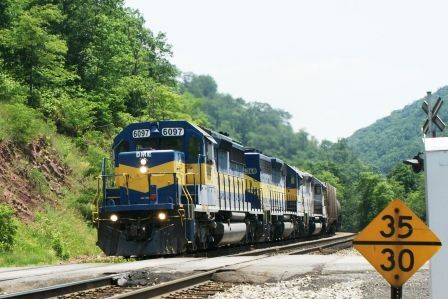 A train from the connecting road could also arrive via trackage rights at one of your yards or industries to do work, and then turn around and return "home." Transfer runs from different railroads on the same layout could also cross over from line to line.